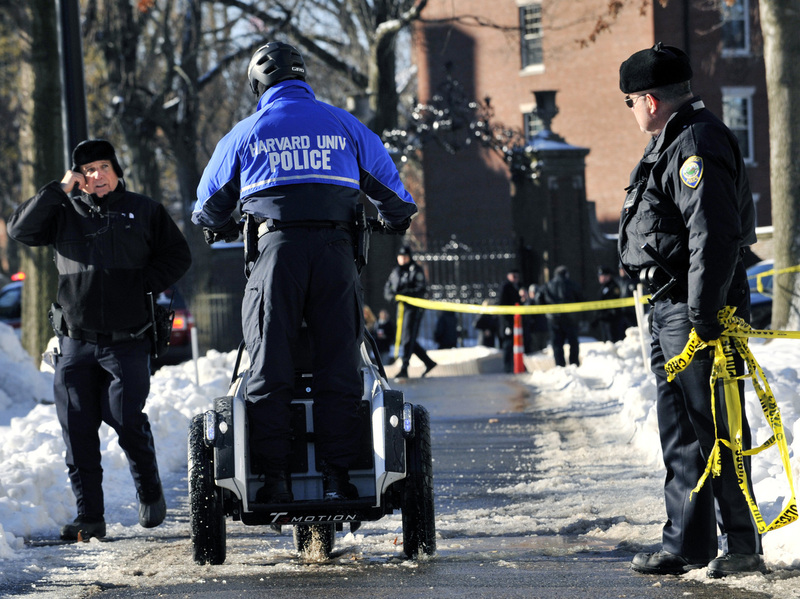 Student Is Charged In Harvard Bomb Scare : The Two-Way Four buildings were evacuated and tensions were high at the university on Monday after officials received messages about "shrapnel bombs." With exams scheduled for that day, many thought that perhaps a nervous student was trying to avoid taking a test. The FBI alleges that's what happened. University police, FBI agents and Cambridge, Mass., officers all responded on Monday when Harvard received messages claiming that bombs had been planted in four buildings. None were found and a student has been charged in the hoax. he allegedly wanted to avoid taking a test. The initial suspicion of many — that Monday's bomb scare at Harvard University was the work of a student who wanted to avoid taking a test — may have been correct. "A Harvard University student who was allegedly trying to get out of a final exam has been charged with making bomb threats that led to the evacuation of four campus buildings and the cancellation of some final exams Monday," our colleagues at WBUR report. "be quick for they will go off soon"
-- The emails' author had used "a service called Guerrilla Mail, an Internet application that creates temporary and anonymous e-mail addresses available free of charge." -- "Further investigation yielded information that the person who sent the e-mail messages accessed Guerrilla Mail by using a product called TOR, which is also available free of charge on the Internet and which automatically assigns an anonymous Internet Protocol ('IP') address that can be used for a limited period of time." -- "Harvard University was able to determine that, in the several hours leading up to the receipt of the e-mail messages described above, ELDO KIM accessed TOR using Harvard's wireless network." When the FBI and campus police interviewed Kim on Monday evening, the FBI agent's account adds, Kim "stated that he authored the bomb threat e-mails. ... According to KIM, he was motivated by a desire to avoid a final exam scheduled to be held on December 16, 2013." Kim is due to appear in a federal court in Boston on Wednesday. He's charged with making bomb threats and if convicted could be sentenced to as much as five years in prison. "The final for Government 1368 was scheduled to take place at 9 a.m. on Monday in Emerson 210 and was among the exams evacuated Monday morning following the bomb threat. The Crimson could not immediately confirm if Kim was enrolled in the course." "KIM was scheduled to take a final exam in Emerson Hall, a building on the Harvard campus, at 9:00 a.m. on December 16, 2013. KIM stated that he was in Emerson Hall at 9:00 a.m. when the fire alarm sounded and the building was evacuated. According to KIM, upon hearing the alarm, he knew that his plan had worked."